A note to my regular viewers. October 21, 2006. This web site now has a new server so I am back in the edit mode. The current content will be around for the foreseeable future. I am maintaining another Bible study site at (www.scripture-studies.com). Check out my latest Bible studies on my mirror Bible study web site. My interests are varied, including photography. Here are a few of them. You may have notice that some scripture verses are hyperlinked to Bible Gateway.com. Please use this as a convenient tool for study - I'll be doing more and more of this to save space on my study documents. Oh yes, please note that for some reason when a hyperlink spills over to the next line that only the last part that is on the second line actually works - don't know why this is happening. Confessing our personal sins to the Lord is a privilege not a duty. For the truly regenerate mind it is not a matter of being sorry we are caught in our sin but that we want to please the Lord. Confession is the result of the ministry of the Word and the conviction by the Holy Spirit in our hearts. This is a bible study I gave some time ago. I think it deserves revisiting. March 6, 2005, Christ the Slain Lamb. January 16, 2005, Christ the Intercessor, Part 3. John 17:20 - 26. Jesus prays for all believers that they will share the wonderful fellowship that is between the Father and the Son. January 9, 2005, Christ the Intercessor, Part 2. John 17:6 - 19. Jesus prays for the 11 disciples and by extension for us. A look into the progression of the names of God. A look at the name of God: Heavenly Father. January 2, 2005, Christ the Intercessor, Part 1. John 17:1 - 5. A look into the heart of the Gospel. Jesus prays to the Father to be returned to His former Glory. December 19, Where Were You when the Other Shoe Dropped? December 12, The Work of the Holy Spirit. We enter John 16 with a wrap-up of Jesus' parenthesis comments of chapters 14 and 15. This lesson covers the deep sorrow that the disciples and sometimes we must experience. Jesus cares for us in our anxieties and wants us to share these painful experiences with Him. Then the work of the Holy Spirit is continued. Next time we will be looking at the Joy that comes from our relationship with Him. December 5, Fellowship with Christ - Enmity with the World. Now we come to the harsh reality of our fellowship with Christ. The world will hate us because we love Christ. Jesus delivers the "news" but continues to comfort them. November 28, The Fellowship of the Vineyard, part 2. Continuing on with this passage in John 12 - 17 we see the friendship that exists between Jesus and His disciples. How can this be? The Creator of the universe, the friend of sinners saved by grace? Let's take a look. November 7, The Fellowship of the Vineyard. We continue to explore the wonderful passage in John 15:9 - 11 where we see "the other great passage on God's love" (Holman's comment, page 285.) We see that our relationship with our Lord brings great love - God's love into our lives. This results in the Joy of Jesus. The Joy of Jesus is not dependent in any way on our circumstances - rather, it is a great Constant, like the speed of light, only more so, that we can depend on. October 31, Fellowship with God - The Believers Responsibility. We take a look at John 15:7 and find a challenge to conventional thought regarding prayer. We explore what it means to abide in Christ and He in us. Then some a challenging look at the fact that we are commanded to pray and to expect them to be fulfilled. October 17, Christ the True Vine, part 2. We continue this section as we delve into the word-picture of the vine. The fruit of the branches is discussed. We see the progression of Jesus' portrayal of our relationship with Him from "little children" to "brothers." And what about those believers who have fallen along the way? Again the picture of the The True Vine and the Vine-Dresser, our Heavenly Father gives us hope that there is effective ministry and relief. October 10, Christ the True Vine. Chapter 15. Our fellowship with Christ is developed by the word-picture of the vine. This pass is directed to the disciples. Judas has left the fellowship forever to betray the Lord. The disciples will be hitting even lower to the bottom of their spiritual experience. Jesus offers this image as a form of comfort and a gentle warning to be ever careful of their relationship to Him. October 3, Gospel of John Review. We will take a look at where we have been and look to the end of the Gospel of John. This will include the personal ministry of Jesus to his disciples (and to us) and the Consummation and Resurrection and final victory of Jesus Christ, our Savior. This section has special meaning to me. As a child, I did not enjoy a close intimate relationship with my parents. Jesus' promise that He would not leave his disciples "orphans" (John 14:18) fills a deep emptiness in my life. He is my Personal Savior! May 2, 2004, Chapter 7, Belief and Unbelief Contrasted. By the time we get to John chapter 7 there is sharp division among Israel whether not Jesus Christ is the Messiah. The rulers have established a reign of fear strengthened by ostracism and even death, many of the people are afraid to voice their opinion about Christ. Jesus condemns the tight reign of fear the rulers have over the people - Jesus popular ministry comes to a close - he must now be careful not to fall into the hands of the rulers before His time of going to the Cross. April 25, 2004, Christ, the Bread of Life. Jesus Christ uses the eating of bread as a figure of how He is able to give the sinner, life itself. This follows the miracle of the feeding of the thousands which serves as a dramatic object lesson. Other word pictures are referred to in this lesson. Jesus' popular ministry is coming to a close. We are introduced to the beginning of this ultimate rejection - even the Galilleens will eventually reject Jesus, the Bread, of Life. April 18, 2004, The Four Witnesses for Christ. We conclude John chapter 5 with the four Witnesses for Christ; John the Baptist, Christ's works, the Heavenly Father and the scriptures. An indictment against unbelief is given to those who vainly tried to judge Jesus Christ for healing an infirm man on the Sabbath and giving him eternal life. April 4, 2004, Lesson 14, The Responsibility of Belief on Christ Revealed. March 28, 2004, Lesson 13, The Life of Christ Demonstrated - the Importance of First-time Faith. March 21, 2004, Lesson 12, Quenching Spiritual Thirst - an Evangelistic Thrust into Samaria. We continue to see the evangelistic emphasis of John's Gospel. Here we are introduced to the fact that Jesus desires a personal relationship with all - the ostracized, the odd - even those whom you might not even want to speak to. Salvation is for all sinners, not just a select few who have a proper lifestyle. March 14, 2004, Lesson 11, The Life of Christ Declared, the Decision is Ours. John the baptizer's ministry is waning and his disciples are worried. When they come to him with their worries, John finally declares his mission and that of Jesus Christ. In this poignant narrative we glean the crux of salvation. In the end of all things, the decision is ours. Will we receive Christ and gain Eternal Life or reject Him and be condemned? March 7, 2004, Lesson 10, The Life of Christ Declared. Chapter three launches us into the crux of salvation. Here is where we find the greatest verse in the Bible: John 3:16. I'm calling it the Executive Summary of salvation. Nicodemus is a leader of the Jews and he is interested to validate his assumption that Jesus Christ is the promised Messiah. What follows is Christ's own evangelistic proclamation of Eternal Life offered not only to Nicodemus but the whole world. February 22, 29, 2004, Lesson 9, The Glory of Christ Demonstrated. Jesus has been set aside unto His Messianic ministry (His Baptism), the Father and the Holy Spirit have attested to His Sonship. He has returned victorious from His temptation and now begins His journey to the cross. We have on one hand a very tender moment with his mother and His first miracle and on the other hand a powerful demonstration of His Authority as the Son of God. John chapter two. We have the lesson of how important our personal lives are with Him and how He demands a life set apart unto Him. NEW - We look into the sobering fact that Jesus Christ knows the heart of every man and its implications both now and in eternity. Saving Faith versus superficial faith is discussed. February 15, 2004, Lesson 8, The Witnesses. Let's look at the first chapter of John and see the various witnesses who testified that Jesus Christ is the Son of God, the Life, the Light-giver, the Lamb of God, the King of Israel. Backgrounds for John the baptizer and John the Apostle are given. We see the first proto-evangelists in action. February 8, 2004, Lesson 7, The Light's Witness, John the Baptizer. Not only did John the baptizer testify of the coming Christ but as part of preparing Israel for Christ, he had a life-changing ministry. There is a striking parallel between his and today's times. February 1, 2004, Lesson 6. The Victorious Light. John 1:5 is explored. It is a powerful statement that His Life and Light that is the intended possession of man will not be thwarted by darkness. Sinful man will be evangelized and will come to know Him as the Life-Light giver. Lesson 5.The Logos, the Light of Life. The Logos, the Light of Life. John 1:4. We are introduced to Jesus Christ's redemptive work and His beneficence toward man. The connection of His Life and His Light is explored. Lesson 4. The Work of Christ: Creation (Part 2). See below, continuation of lesson 3. Lesson 3. The Work of Christ: Creation. The Work of Christ: Creation. John 1:3 is a powerful verse. It completely refutes the so-called theory of evolution. His Conservator work of maintaining the universe is covered and more. Lesson 2. The Person of Jesus Christ. The Person of Jesus Christ. Jesus as God-Man is a Person - not merely a good man nor just the greatest prophet of all time. Lesson 1. The Uniqueness of Jesus Christ. The Uniqueness of Jesus Christ. Jesus Christ is the Unique God-Man of the universe. John the Apostle begins his gospel by taking us beyond creation and develops a masterful treatise on the Logos' existence and His Person. John presents three arguments. First, the Logos, Jesus Christ, always was eternally existing at and before creation. Second, the Logos was forever in intimate, reciprocal communion with the other Persons of the Trinity. Third, the Logos was always divine. He was never less than God in essence. Part three of "Things that Matter Most." The believer has been given through the New Birth the capacity to understand biblical truth. God chooses ordinary men to serve Him. Here is a devotional that might be an encouragement to you. God Chooses Ordinary Men to Serve Him. Upcoming Discipleship Series, "Things That Matter Most, Life in Christ." Sunday, February 9 Sunday School Lesson, "Our New Life in Christ." Sunday, January 26 Sunday School Lesson, "The Things That Matter Most, Part two." Sunday, January 19 Sunday School Lesson, "The Things That Matter Most." Sunday, October 27 Sunday School Lesson, "The Conclusion: Life can be Fulfilling with Christ." Sunday, October 13 Sunday School Lesson, "The Futility of Life Without Christ Defined." Sunday, October 6 Sunday School Lesson, "The Third Argument Against Life Without Christ." Sunday, September 29 Sunday School Lesson, "The Value of Friends." I really enjoyed presenting "The Value of Friends." There is a hint of the powerful biblical concept of Right Man / Right Woman in this lesson. This is a must-read lesson, in my opinion. Sunday, September 15 Sunday School Lesson, "The Supremacy of the Sovereignty of God." Sunday, September 8 Sunday School Lesson, "The Worshipful Act of Giving." Sunday, September 1 Sunday School Lesson, "The Three Paths Man can Take Without Christ." Sunday, August 18 Sunday School Lesson, "The Pursuit of Achievement and Possessions is Futile without Christ." Sunday, August 11 Sunday School lesson, "Introduction to Ecclesiastes' Argument against life without Christ." Please check my "Archive Page" for some of the Proverbs series lessons that were here. NEW! Bible study on "Doing God's Will." See also the side bar on this page "Discovering God's Will." This is a series that I gave several years ago. I think it is such an important subject that we are repeating it in Sunday School class. I invite you to check it out and attend Sunday School class at Calvary Bible Church (10:30 AM). For directions click here. Check out my Archive Page also for a Devotional section. These are short, devotionals that I am sending out to my Sunday School folks. Check it out. NEW! The Energy and Expression of God's Love. In Adobe format - just the way it appears in my notes. Just finishing a Bible Study series that I call Lives Touched by Jesus Christ. It has been a wonderful experience. Jesus never comes in touch with a life without that life being forever changed. Check it out. "Our Fathers Faith" is an Old Testament survey. The emphasis is on following God's Redemptive Plan throughout the Old Testament. Free Winzip download for viewing some of my Bible Studies here. Here's my Bible Study Archive section. Here's a Sermon that I preached at my local Church. "God's Passion for you and me." God Loves you and has a wonderful plan for your life - please read this! Playing the piano & Southern Gospel. 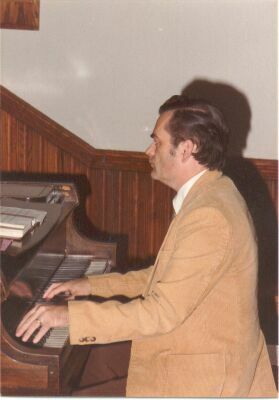 I used to play the piano for my church. This is an antique piano - I think it is a Vose. It had a delightfully light touch - I could play it for hours. I formed a Southern Gospel Quartet - "The Crusaders." We practiced for hours using that piano. Yup - I used to lay the book stand down - the sound from the piano was better that way. Note the lack of gray hair! Classical Music. My favorite composer is Mozart. Computers. I really enjoy publishing for the internet although I am just a novice at it. Amateur Radio. I have enjoyed this hobby since I was a teen. Lots of really nice people are "Hams."